Generic City (TWO ACORNS 2A01) is a collaboration between the Japanese artiste Yui Onodera and Celer, a project which envelops the talents of Will Long (who runs the Celer label, of which Two Acorns is a tributary) and Danielle Baquet-Long. The team have put together several original and contemporary field recordings, many of them inseparable from an urban locale, but birds, trees, and weather all manage to wing their way into the conversation too. Above all else, there seems have been some lengthy considerations and ponderments taking place by the creators about the culture and characteristics of the environments that surround them, not taking anything for granted and using the work as a means of interrogating what it means to be Japanese, for example. Between them they stress such aspects as time travel, imagination and story-telling, which might be read as interesting mental strategies for escaping the confines of everyday life. What emerges are four fairly dreamy and disconnected episodes of meandering near-bliss, sometimes augmented by additional electronics and musical instruments, all melted down through the nuclear fission of the mixing desks. I often rely heavily on the Monochrome Vision label to unearth buried treasures (past and present) from the more sinister pockets of the electro-acoustic open-cast mines. The CD by Karl Bösmann has not perhaps been an utterly astounding revelation at this time, but there’s plenty of grit and brooding pensiveness afoot in the scheming, angsty compositions that crawl out from the three dimly-lit corners of Euphoria Mitte (MONOCHROME VISION MV32). A self-released and limited-publication electro-genius following his own wayward instincts since 1999, Bösmann (even his name is deliberately ambiguous, so a writer from Bad Alchemy assures us) would like it known he aligns himself with two of the key figures from the United Dairies label, that is Organum and Nurse With Wound, yet opts neither for basso-profundo drone methods nor cod-surrealist antics on these 12 exciting recordings, which (while they may not always come to a satisfactory conclusion) are executed with as many different styles and approaches as Picasso had camel-hair brushes lurking in his enormous ceramic jars. Very strong clashes of unfamiliar electronic surfaces, with occasional cinematic flashback use of found voices. I’d like to get excited about Sleepercell (LUMBERTON TRADING COMPANY LUMB013) mainly due to the nifty cover art, which resonates strongly as a memento of the LP cover to the second Blue Öyster Cult LP; it’s a motif I’ve even tried to imitate myself. Steven Severin (ex-Banshees) has discovered the “Numbers Stations”, around which something of a cult has grown (like barnacles on the hull of a ship) since the release of the Conet Project 4-CD set in 1997. Severin uses samples from these mysterious shortwave radio broadcasts as the raspberry ripple in this 20-minute EP of vanilla ice cream, which to me is virtually indistinguishable from any other identikit ambient record made in the last ten years. Very dull. 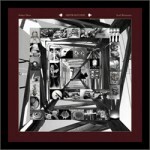 Andrea Marutti and Fausto Balbo set their duelling synths at each other’s beards like two Renaissance-period Italians committed to a deadly vendetta on Detrimental Dialogue (AFE RECORDS AFE127CD / BORING MACHINES BM023 / FRATTO 9 UNDER THE SKY RECORDS FRATTO 012)…actually it’s not quite as lively a bout of blood-letting as that might suggest, rather a slow exploration of vague, surreal, and unfamiliar territories, extended into long sojourns and episodes of odd musing. Stefano Rossetti’s striking artwork depicts the pair as insects with speakers embedded in their coils. Paw Music (HERMES DISCORBIE HD CD 10 / REQORDS REQ-002 / RONDA RND14) is a quite striking and, in places, highly original improv session recorded in Budapest on 2002. The trio involved are Én, Q. and Ahad, of which Q. (Quentin Rollet) plays the alto sax while the other two (Pål Tóth and Zsolt Sörés) work with a goodly measuring-jar full of electronic equipment, including close-miking techniques of small objects, analogue synths, microphones, and feedback. There are two long pieces, including the 24-minute ‘Old Smuggla’, which are quite superb – careful and detailed investigations of virtual sonic space done with an inspired and clear-thinking methodology. Slow, rumbly and utterly abstracted music, lots of minimal events and incidents, yet still furnished with plenty of room to breath – fascinating well-crafted work all round.